Swiss International Airlines has revealed it is converting its five remaining options for the Bombardier C Series to the larger CS300. The company, which was the launch customer for the CS100, will eventually operate a fleet of ten CS100s and 20 CS300s. Swiss says new aircraft deliveries will reduce the average age of its fleet from 12.5 years to 8.5 years by the end of 2018. The Star Alliance carrier is also investing CHF100m in refurbishing its five remaining Airbus A340s and launching a programme to introduce inflight connectivity to its medium- and short-haul fleets next year. “By the end of next year we will have one of Europe’s most advanced and efficient aircraft fleets,” explained Thomas Klühr, Swiss’ CEO. Investments will also be made at the airline’s Zurich Airport hub. A new First Class Lounge will be introduced on the Check-In 1 concourse by the end of the year providing guests with their own security checkpoint and a dedicated walkway to their limousine transport. The 650m2 facility will also have an à la carte restaurant, a staffed bar and an area equipped with workstations and showers. The Business Class and Senator Lounges in Terminal A will be refurbished with work scheduled for completion in the first quarter of 2018. These investments total more than CHF15m. “Our new premium product on the ground will offer our customers genuinely new levels of air travel comfort and convenience,” explained Klühr. The carrier warned it expects to post an EBIT for 2017 “slightly below” its 2016 level. It attributed this to the “challenging competitive environment, the strength of the Swiss franc, the present geopolitical uncertainties and the recent tangible increase in the price of oil”. Launch customer airBaltic has successfully debuted the Bombardier CS300 on its Riga-Amsterdam service. The first commercial flight of the type carried 120 passengers, including local media. The Riga-based carrier has ordered 20 CS300s which it is operating in a 145-seat, two-class configuration. Dar es Salaam-based Air Tanzania will add two Bombardier CS300 airliners to its fleet after the Tanzanian Government Flight Agency (TGFA) signed a firm purchase agreement with the manufacturer. Also included in the deal is a Q400 turboprop. The three aircraft, which have a combined value of $200m, will be leased and operated by Air Tanzania. Two Q400s entered service with the carrier earlier this year, flying domestic and regional services. The Q400 will feature a 76-seat all-economy configuration while the CS300 will be in a two-class layout and equipped with WiFi and in-flight entertainment. Bombardier says this deal takes its recorded firm orders for the Q400 to 566 and the C Series to 360. 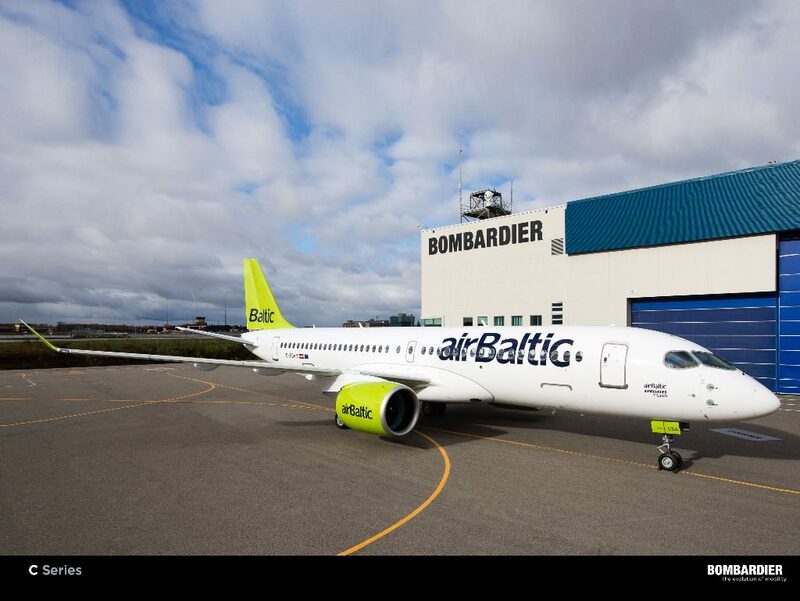 Launch carrier airBaltic will debut the new Bombardier CS300 on its Riga to Amsterdam connection on December 14. Flight BT619 departs Riga at 1625hrs arriving at Schiphol at 1750hrs. The return service, BT620, departs the Dutch city at 1855hrs arriving back in Latvia at 2210hrs. The Riga-based airline is expected to take delivery of its first of 20 examples in early December, with the 145-seat aircraft planned to make its UK debut at Gatwick on January 7. Delays in the suuply of Pratt & Whitney’s PurePower PW1500G engine have led Bombardier to revise its C Series delivery schedule. The Canadian manufacturer had planned to hand over 15 aircraft by the end of the year but this has been adjusted to seven. Bombardier has handed over two CS100s to Swiss with a third due for delivery next month. The manufacturer says the first example of the larger CS300 remains on track to be delivered to launch operator airBaltic in the fourth quarter. The two aircraft in service with Swiss have flown nearly 400 revenue flights, totalling almost 600 flight hours, and Cromer says their performance has been good. Last week, Bombardier confirmed that it had received the second and final $500m instalment of the Government of Québec’s investment in the C Series programme. Bombardier CS300 launch operator airBaltic will begin direct flights from Riga to Abu Dhabi as part of a network expansion facilitated by the new aircraft. The Latvian carrier will receive six of its 20 CS300s this year, with the first due for delivery in October and Chief Executive Officer Martin Gauss explained that while the jets will be phased in gradually they will cover the entire network “sooner or later”. One of the challenges airBaltic gave Bombardier was to enable direct flights between the airline’s Riga base and Abu Dhabi, a journey of 2,338nm (4,333km). At the Farnborough International Airshow, Rob Dewar, Vice President CSeries Aircraft Program, confirmed that the range for airBaltic out of Riga was 2,469nm (4,573km). Amongst the host of new services the airline is looking to introduce are links from Riga to Manchester, Dublin and Reykjavik. “The CS300 will enable us to serve destinations which we were not able to in the past. We can use the aircraft on all destinations airBaltic has, even on the short ones,” Gauss told journalists during a CS300 briefing at Farnborough. Gauss told Airliner World that flights to Abu Dhabi would not start this year. “We will decide when we come to the schedule and planning over the next year.” He said that the link to Abu Dhabi would be a “normal flight” and that turnaround times would be no different to the airline’s current operations. As part of its mission to become a pan-Baltic carrier, the airline is also operating flights from Tallinn in Estonia and Vilnius in Lithuania and these will also be served by the C Series. With the first aircraft due to be delivered in October, focus is switching to the CS300’s entry into service (EIS) and Gauss is aware that there will be a lot of attention placed on both the manufacturer and the carrier. The airBaltic CEO said that there was no formal agreement in place with CS100 launch operator Swiss but the two airlines were exchanging information during the EIS phase. The airline’s aircraft will be fitted with 145 seats and a curtain will be used to divide the Business and Economy cabins. Gauss revealed airBaltic’s jets would feature Bombardier’s built-in in-flight entertainment system enabling the carrier to provide passengers with gate information, a moving map, safety demonstration videos and other customisable content. He confirmed that the airline would introduce Wi-Fi to the CS300 but that it wasn’t fitted on the initial example. Bombardier is celebrating Type Certification of its CS300 airliner by Transport Canada. The achievement was announced on day one of the Farnborough International Airshow. The first CS300 for launch operator airBaltic is currently in production at Mirabel, Québec, and is scheduled for delivery in the fourth quarter. “The CS300 aircraft certification process was very straightforward because of the over 99% commonality with the CS100 model,” said Robert Dewar, Vice President, C Series Aircraft Program, Bombardier Commercial Aircraft. “The C Series flight test program covered more than 5,000 hours and most of the data obtained covered both models. Certification follows the handover of the maiden CS100 to Swiss International Air Lines on June 29. The type will enter revenue service on Friday. 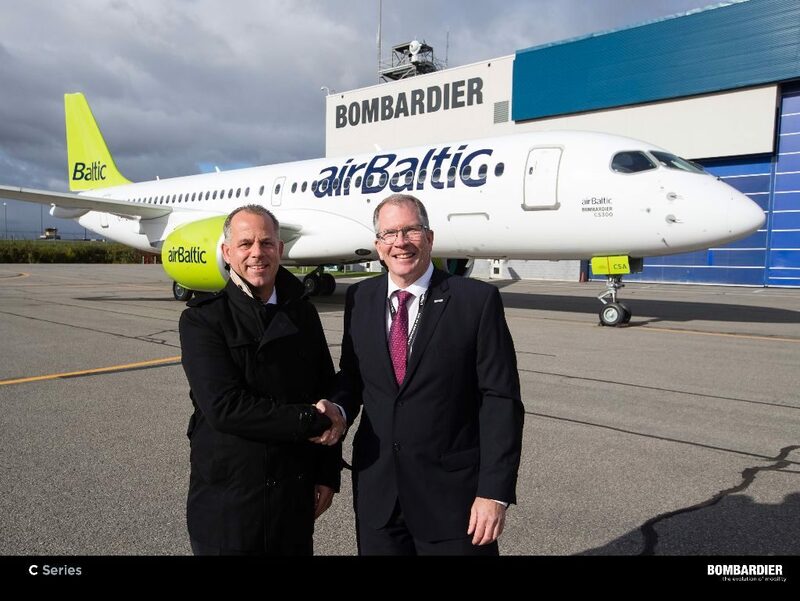 Riga-based airBaltic has signed a purchase agreement with Bombardier Commercial Aircraft to convert its remaining seven options for CS300 aircraft into firm orders. This brings the Latvian carrier’s total firm orders for the type to 20. The original order for ten firm CS300 and ten options was announced on December 20, 2012, with the airline converting three options in February 2014. airBaltic will become the first customer in the world to operate this variant of the C Series when it takes delivery of its first example in the second half of this year. Bombardier said the value of this latest contract was $506 million, based on list prices. As the launch customer of the Bombardier CS300, airBaltic’s senior management, including Chief Executive Officer and Chairman of the Board Martin Gauss, paid a visit to the Canadian manufacturer’s Mirabel, Montréal final assembly line to see the progress of the carrier’s first aircraft.